The BHS color guard performs during the Winterguard International World Championships where they placed 12th overall. The color guard competed in the last week in Dayton, Ohio where they finished 12th place overall. Going into the competition, the color guard was ranked 24th in their division. 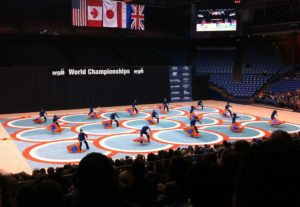 They placed 1st in their group to advance through the preliminary round on Thursday, moving them to 16th place overall. They competed again on Friday afternoon for the semi-final round of competition and placed 3rd in their round and earning them a spot in the finals competition for Friday night. Color guard director, Marie Debellis, said the team pushed themselves physically and mentally during the event, but represented BHS at the highest level both on and off the court.